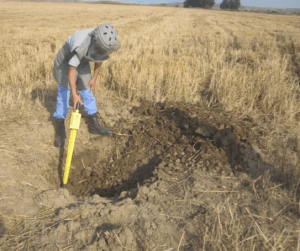 The Schonstedt Humanitarian Demining Initiative (SHDI) continues to help save lives in countries that need it the most. Here’s a recent posting from the Azeri News Agency (APA). Baku – APA. Azerbaijan National Agency for Mine Action (ANAMA) on Wednesday released a report on the unexploded ordnances (UXO) discovered in the Terter district. According to the report, two UXOs, as well as the detonating fuse of a 122 mm artillery shell were seized as a result of the inspection conducted at five explosion sites in the Jamilli village of Terter. In general, from 7 April to 22 June, ANAMA inspected a total of 619 houses and yards, 2 military units, 2 rural cemeteries, 5 rural schools, 1 medical facility, 24 farms, sown areas, and 1 wine factory in the districts of Zardab, Terter, Aghjabedi, Aghdam, Fuzuli, Goranboy, Tovuz, Samukh, Shamkir, Jalilabad, Ujar, Astara and in the cities of Baku, Sumgayit and Minghachevir. As a result, 1,544 UXOs, 14 anti-pedestrian mines (PMN), 3 anti-pedestrian POMZ-2 and 8 anti-tank mines were found and neutralized. The agency continues the operations. The post SHDI in Azerbaijan appeared first on Schonstedt.